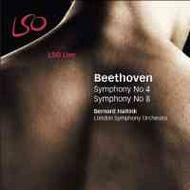 Bernard Haitink's internationally acclaimed LSO Live Beethoven cycle reaches its magnificent conclusion with the release of the Fourth and Eighth Symphonies. Coming between two of Beethoven's most famous symphonies, the Fourth Symphony can seem relatively lightweight and cheerful. It was written for Count Franz von Oppersdorff, who wanted a symphony similar in vein to the Second. Beethoven's Eighth Symphony sees him in playful mood, featuring humorous twists and turns and relatively brief movements, including the shortest movement of any of his symphonies.